The producers of the acclaimed Anthony Bourdain series on food adventure are in the midst of creating a special to be called “Fries,” filmed around the world and bringing into perspective the cultural phenom of Fries, a subject I’ve been enthusiastically wring on in FrenchFryHistory. Com for a while. Looking forward to it, while now enjoying great fries in NewZealand and soon Australia, as we steam north-west across a foggy Tasman Sea pre-dawn. Think about it. McDonald’s just launched limited-time cheesy bacon fries, no doubt targeting Wendy’s Baconator Fries (which, to be fair, have been around for nearly four years). Wendy’s responded to the launch by putting its version in the promotional spotlight – free Baconator Fries to anyone who ordered through the brand’s mobile app – inciting a bacon fry battle of sorts to start the New Year. French fries have long been a quick-service staple, as well as the subject of intense debate over which brand does them best. However, a case can be made that recent launches have been different. Sexier. Consider Taco Bell’s Nacho Fries, for example. 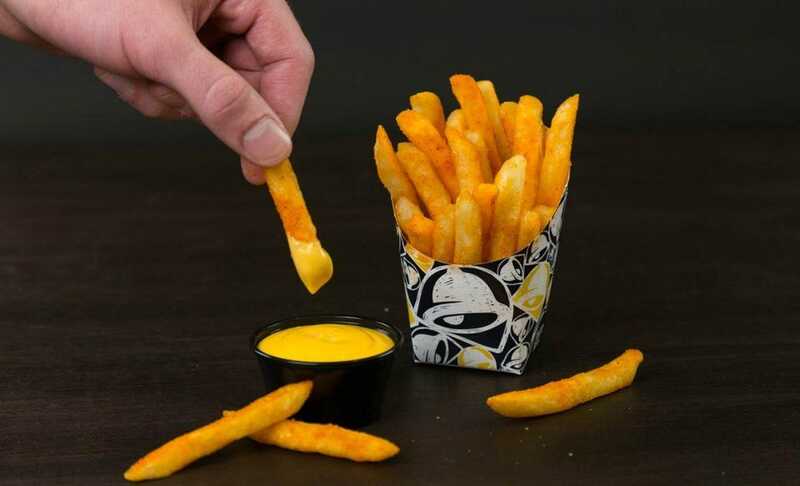 First introduced in January 2018, the Nacho Fries quickly became the brand’s most successful product launch ever – more than 53 million orders were sold in the product’s first three months alone. The fries made up more than 30% of all Taco Bell orders, yielding both check and transaction increases. So successful was this product launch, Taco Bell has already brought it back twice as a limited-time offer. Nacho Fries were inarguably a major factor in the chain’s strong 2018 performance. The New York Times discovers French fries aren’t healthy — and also proposes an unexpectedly brilliant solution. Today, the New York Times uncovered a dark truth: French fries are not healthy. Did you know? “If French fries come from potatoes, and potatoes are a vegetable, and vegetables are good for you, then what’s the harm in eating French fries?” asks the paper’s Christopher Mele, before launching into an extensive explanation of the fry’s many dangers. Buried in this warning, amid various suggestions to mitigate the impact of fry indulgence — be wary of excessive condiments; eat homemade baked fries instead — is a brilliant proposal. It would be nice! Is it possible the solution has been so simple all along? A side salad, and just a handful of fries for good measure, enough to bask in the supreme pleasure of fry-eating without being forced to exercise otherworldly self-control or to fork over the cost of a full order. It would be a bite of fry. An essence of fry. A fry-nibble. Not a commitment to FRIES, but enough to have partaken in frydom. A casual fry-fling. I am certainly not advocating this be the only option: Full orders of French fries should, of course, continue to exist. Fries are delicious, and foods do not have inherent moral value. I want to rob no one of their fry experience. Nor am I suggesting that salads cannot be pleasurable. I am skeptical that most fast-food side salads are pleasurable, but this is a logistics problem, not a categorical one. Salads: often good, sometimes transcendent. I am simply suggesting that in many circumstances, it would be an ideal option. Consider the following: You are at dinner with a companion, who has ordered fries. You, on the other hand, opted for the salad. But you would like a fry. Just one fry. Two fries. Perhaps three fries. “Can I have a fry?” you say. What if, though, you did not have to ask? What if you, a self-sufficient individual, could just order your own three or six or nine fries? Are these not modern times? Or: You are at dinner with a companion, who has ordered a salad. You, a person who wants fries, have ordered the fries. “Can I have a fry?” they say, longingly, and you oblige, because that is our social contract. Wouldn’t it be better if they could just order their own A Fry? Or: You are alone, which is also a great way to eat. You want to order the salad. Leafy greens. A good tomato wedge. For any number of legitimate reasons — health, taste, appetite, how your digestive system might feel later, a craving for arugula — you don’t want a full order of fries. Wouldn’t it be great if you could just order a side salad with a side-side of fries? Would this not radically overhaul your life? What if, for that matter, fast food offered an a la carte tapas menu? A Nugget; A Tater Tot; A Fry. Haven’t you ever wanted whatever your order was, and also a lone nug? Is this a good idea, from a business perspective? Almost certainly not. So let’s aim low, together. Let’s focus on fries — a handful, a sampling, a six-pack of fries. Burger Fi and other spots have special deals for National French Fry Day. What better way to celebrate a Friday than with French fries? Today, July 13, is National French Fry Day and plenty of places are offering free or discounted deals on everyone’s favorite crispy potato treat. Not every location participates in all promotions, so be sure to check ahead. Place an order via McDonald’s mobile app for $1 or more and receive a free medium order of fries. Selected locations are offering free order of regular hand-cut fries with any purchase. Offer good July 13 only from open to close. Get two small orders of fries and two Original Chicken Sandwiches for $4.99 with a coupon in the restaurant’s app. Sign up for the chain’s emails and receive a free small fries and beverage with purchase of any One-Third Pound Thickburger. The chain has brought back Nacho Fries. French fries have nothing to do with France – as many Belgians will attest – so why we do mistakenly refer to them as ‘French fries’? Where did French fries come from? Fries form half of one of the top Belgian foods along with a pot of mussels – known as moules frites – and are a national Belgian symbol with political punch. If you say the word potato, the Irish Potato Famine of 1845 and the origination of tubers in South America come to mind. But chop them up, drop them in a vat of simmering oil, add a touch of salt and you’ve got a whole new ball-game of Belgian fries. So where exactly is the French fries origin? Indeed, you will make no mistake about the French fries origin once you visit Belgium: Fries have permeated into every pore of Belgian culture from pop art and comic strips to music and advertising. You will find fritesstalls (frietkot) across Belgium, which are certain to ensure the economic return on Belgian potatoes (bintjes) for eons to come. Where did French fries come from? The ‘chip’ or ‘French fry’ has gone a long way in putting the Kingdom of Belgium on the map – culinary or otherwise – even if they are called ‘freedom fries’ in-flight on Air Force One, ‘patates kizartmasi‘ in an Istanbul Café, ‘gamza teekim‘ on the streets of Seoul or ranskalaiset perunat sitting on a bench in Helsinki. Often mistaken as French in origin, the word ‘french’ became synonymous with frites due to the fact that, in old English, to ‘french’ was to ‘cut lengthwise’. Hence, the French fry. “We modest Belgians don’t mind the French claim because we know that fries are God’s gift to our people,” exclaims a website completely dedicated to the art form of Belgian fries making. You wouldn’t be the only one to mistake the French fries origin. ‘Fry ban targets wrong country’ went a Reuters headline at the height of the French product boycott in the US following its stance against the Iraqi conflict. “The chip is essentially regarded in Belgium as a culture, social strata and gender bridge: soul food,” says Paul Ilegems, curator of the Belgium Chip Museum on the second floor of Frietkot Max on Antwerp’s Groenplaats. A bit harsh perhaps but it’s obviously clear that frites are serious stuff in Belgium. “Belgium is beer, cartoons, mussels, chips and the Royal family,” a frietkot (frite stall) owner sums up. What we recognise today as Belgian ‘frites‘ or ‘friets‘ is thought to have originated in the Meuse region in the year 1680. The poor inhabitants of the Meuse valley area subsisted mainly on fish, but when the river Meuse froze in 1680, potatoes were cut into the shape of fish, fried and used as a substitute to their main staple – or so the story of Belgian fries goes. The Belgian tourism board says that Belgian fries – ‘les frites’ – were incorrectly named ‘French fries’ by American servicemen when they came to Belgium at the end of World War I. The French fries mislabel was reportedly the result of naming the fries after the French language spoken in Wallonia. There has been much disagreement over the origin of frites as the region lies in the heart of French-speaking Wallonia, forcing Flanders to desperately seek a Flemish origin to the food. But, as in most countries, food can define culture and in frites are generally accepted as a unifying force and thoroughly ‘Belgian’ – francophone or not. French fries (or rather Belgian fries) are thought to have arrived in the US in the late 1700s when Thomas Jefferson brought the method back to the colonies. We can guess it’s the method he brought back and not a soggy bag of chips. In the UK, the first chip is believed to have materialised at Dundee Market in the 1870s, traded by a Belgian immigrant named Edward De Gernier. As for the frites add-on essential, mayonnaise, its origin is cloudy. One theory connects it to the harbour town of Mahon, liberated by Cardinal Richelieux from the English. The towns of Bayonne and Mayon, however, also claim the golden morsels as their own. Frites have essentially become a national Belgian symbol sold out of caravans and shacks and chalets, fried twice (trade secret), dash of salt, glob of mayonnaise, a little plastic fork and presto: perfect fries. The idea has been exported to New York and, as the song goes, if a chip can make it there it can make it anywhere. Lest we forget though that there are many levels of Belgian chip-eatery – not all of them are handed over a greasy counter in an off-white paper cone by a burley chip-van owner in Anderlecht. On restaurant menus you can find filet mignon served with a chiffoné of pommes frites, if you please. Fries have come a long way since their fishy origins and have mutated to fit each culture that has adopted them – newspaper-stained and doused in salt and vinegar in Birmingham, or cooked in peanut oil and served in a basket of palm leaves in Borneo, to name a few. But they remain Belgian through and through while encouraging Breughel-belly across the globe. Although the US may not have known it, they were killing two birds with one stone when they boycotted French fries – they made a point to the French and rejected a Belgian product at the same time. Who would have guessed the political power of potatoes? The best potatoes for French fries are fresh, never frozen, and with a medium-firm consistency that is not too firm nor too soft. In the best French fries recipe, frites are cut rectangular around 1cm square. The secret to the Belgian fries recipe is that the potato is fried twice. The Belgian tourism board recommends that the first fry should be done at 150°C and the second fry at 175 °C. pickel sauce – a yellow, vinegar-based sauce with turmeric, mustard and chunks of crunchy vegetable. sauce americaine – mayonnaise with tomato, chervil (French parsley), onions, capers, seafood stock and celery. Read tips on how to get perfect French fries in this not-no-secret French fries recipe. “Fries” redirects here. For other uses, see Fries (disambiguation). French fries (North American English), chips (British English), finger chips (Indian English), or French-fried potatoes are batonnet or allumette-cut deep-fried potatoes. 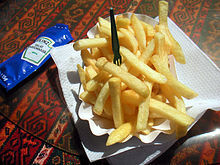 In the United States and most of Canada, the term fries refers to all dishes of fried elongated pieces of potatoes, while in the United Kingdom, Australia, South Africa (rarely), Ireland and New Zealand, thinly cut fried potatoes are sometimes called shoestring fries or skinny fries to distinguish them from chips, which are cut thicker. French fries are served hot, either soft or crispy, and are generally eaten as part of lunch or dinner or by themselves as a snack, and they commonly appear on the menus of diners, fast food restaurants, pubs, and bars. They are usually salted and, depending on the country, may be served with tomato sauce, ketchup, vinegar, mayonnaise, or other local specialties. Fries can be topped more heavily, as in the dishes of poutine and chili cheese fries. Chips can be made from kumara or other sweet potatoes instead of potatoes. A baked variant, oven chips, uses less oil or no oil. One very common fast food dish is fish and chips. French fries are prepared by first peeling and cutting the potato into even strips. These are then wiped off or soaked in cold water to remove the surface starch, and thoroughly dried. They may then be fried in one or two stages. Chefs generally agree that the two-bath technique produces better results. Potatoes fresh out of the ground can have too high a water content – resulting in soggy fries – so preference is for spuds that have been in storage for a while. In the two-stage or two-bath method, the first bath, sometimes called blanching, is in hot fat (around 160 °C / 320 °F) to cook them through. This may be done in advance. Then they are more briefly fried in very hot fat (190 °C / 375 °F) to crisp the exterior. They are then placed in a colander or on a cloth to drain, salted, and served. The exact times of the two baths depend on the size of the potatoes. For example, for 2–3mm strips, the first bath takes about 3 minutes, and the second bath takes only seconds. There are several common techniques to cook French Fries. Deep frying is a cooking method in which food is submerged in hot fat, most commonly oil. Vacuum fryers are fit to process low-quality potatoes that contain higher sugar levels than normal, as they frequently have to be processed in spring and early summer before the potatoes from the new harvest become available. 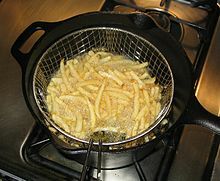 In the UK, a Chip pan is a deep-sided cooking pan used for deep-frying. Chip pans are named for their traditional use in frying chips. Most French fries are produced from frozen potatoes which have been blanched or at least air-dried industrially. Most chain that sell fresh cut fries rely on the Idaho Russet Burbank variety of potatoes. It has been the standard for French fries in the United States. The usual fat for making French fries is vegetable oil. In the past, beef suet was recommended as superior, with vegetable shortening as an alternative. In fact, McDonald’s used a mixture of 93% beef tallow and 7% cottonseed oil until 1990, when they switched to vegetable oil with beef flavoring. Starting in the sixties, more fast food restaurants have been using frozen French fries. Thomas Jefferson had “potatoes served in the French manner” at a White House dinner in 1802. The expression “French fried potatoes” first occurred in print in English in the 1856 work Cookery for Maids of All Work by E. Warren: “French Fried Potatoes. – Cut new potatoes in thin slices, put them in boiling fat, and a little salt; fry both sides of a light golden brown colour; drain.” This account referred to thin, shallow-fried slices of potato – it is not clear where or when the now familiar deep-fried batons or fingers of potato were first prepared. In the early 20th century, the term “French fried” was being used in the sense of “deep-fried” for foods like onion rings or chicken. A patatje speciaal, with frietsaus, curry ketchup or tomato ketchup, and chopped raw onions, is popular in the Netherlands. There is an ongoing dispute between the French and Belgians about where fries were invented, with both countries claiming ownership. From the Belgian standpoint the popularity of the term “French fries” is explained as a “French gastronomic hegemony” into which the cuisine of Belgium was assimilated because of a lack of understanding coupled with a shared language and geographic proximity between the two countries. Belgian journalist Jo Gérard claims that a 1781 family manuscript recounts that potatoes were deep-fried prior to 1680 in the Meuse valley, in what was then the Spanish Netherlands (present-day Belgium): “The inhabitants of Namur, Andenne, and Dinant had the custom of fishing in the Meuse for small fish and frying, especially among the poor, but when the river was frozen and fishing became hazardous, they cut potatoes in the form of small fish and put them in a fryer like those here.” Gérard has not produced the manuscript that supports this claim due to the fact that it is unrelated to the later history of the French fry, as the potato did not arrive in the region until around 1735. Also, given 18th century economic conditions: “It is absolutely unthinkable that a peasant could have dedicated large quantities of fat for cooking potatoes. At most they were sautéed in a pan…”. “French fries” for deep fried potato batons were also introduced when American soldiers arrived in Belgium during World War I. The Belgians had previously been catering to the British soldiers’ love of chips and continued to serve them to the Americans when they took over the western end of the front. The Americans took them to be French fried potatoes because they believed themselves to be in France, with French being the local language and the official language of the Belgian Army at that time. At that time, the term “French fries” was growing in popularity – the term was already used in the United States as early as 1899 – although it isn’t clear whether this referred to batons (chips) or slices of potato e.g. in an item in Good Housekeeping which specifically references “Kitchen Economy in France”: “The perfection of French fries is due chiefly to the fact that plenty of fat is used”. “Pommes frites” or just “frites” (French), “frieten” (Flemish) or “patat” (Dutch) became the national snack and a substantial part of several national dishes, such as Moules-frites or Steak-frites. Fries are very popular in Belgium, where they are known as frieten (in Dutch) or frites (in French), and the Netherlands, where among the working classes they are known as patat in the north and, in the south, friet. 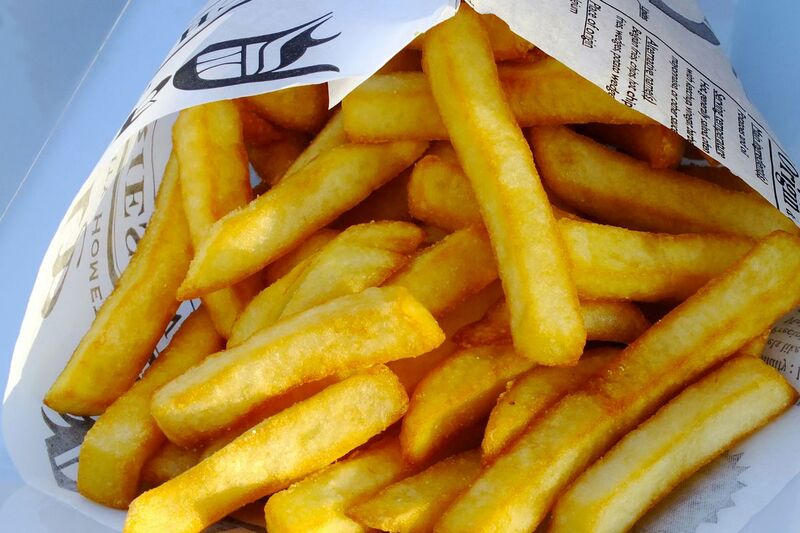 In Belgium, fries are sold in shops called friteries (French), frietkot/frituur (Dutch), or Fritüre/Frittüre (German). They are served with a large variety of Belgian sauces and eaten either on their own or with other snacks. Traditionally fries are served in a cornet de frites (French), patatzak/frietzak/fritzak (Dutch/Flemish), or Frittentüte (German), a white cardboard cone, then wrapped in paper, with a spoonful of sauce (often mayonnaise) on top. Friteries and other fast food establishments tend to offer a number of different sauces for the fries and meats. In addition to ketchup and mayonnaise, popular options include: aioli, sauce andalouse, sauce Americaine, Bicky Dressing (Gele Bicky-sauce), curry mayonnaise, mammoet-sauce, peanut sauce, samurai-sauce, sauce “Pickles“, pepper-sauce, tartar sauce, zigeuner sauce, and À la zingara. In Spain, fried potatoes are called patatas fritas or papas fritas. Another common form, involving larger irregular cuts, is patatas bravas. The potatoes are cut into big chunks, partially boiled and then fried. They are usually seasoned with a spicy tomato sauce, and the dish is one of the most preferred tapas by Spaniards. Fries may have been invented in Spain, the first European country in which the potato appeared from the New World colonies, and assume fries’ first appearance to have been as an accompaniment to fish dishes in Galicia, from which it spread to the rest of the country and then further away, to the “Spanish Netherlands”, which became Belgium more than a century later. Professor Paul Ilegems, curator of the Frietmuseum in Bruges, Belgium, believes that Saint Teresa of Ávila of Spain cooked the first French fries, and refers also to the tradition of frying in Mediterranean cuisine as evidence. In France and other French-speaking countries, fried potatoes are formally pommes de terre frites, but more commonly pommes frites, patates frites, or simply frites. The words aiguillettes (“needle-ettes”) or allumettes (“matchsticks”) are used when the French fries are very small and thin. One enduring origin story holds that French fries were invented by street vendors on the Pont Neuf bridge in Paris in 1789, just before the outbreak of the French Revolution. However, a reference exists in France from 1775 to “a few pieces of fried potato” and to “fried potatoes”. Eating potatoes for sustenance was promoted in France by Antoine-Augustin Parmentier, but he did not mention fried potatoes in particular. 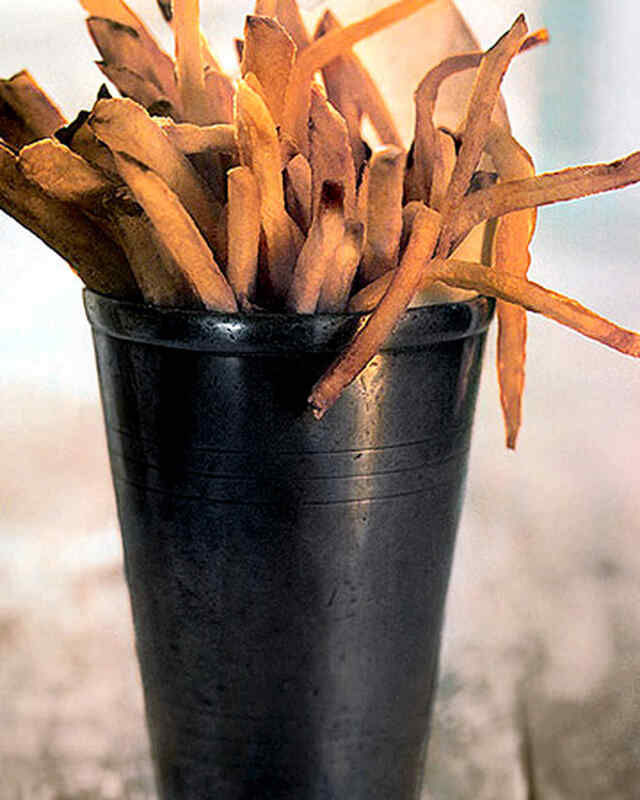 Many Americans attribute the dish to France and offer as evidence a notation by U.S. President Thomas Jefferson: “Pommes de terre frites à cru, en petites tranches” (“Potatoes deep-fried while raw, in small slices”) in a manuscript in Thomas Jefferson’s hand (circa 1801–1809) and the recipe almost certainly comes from his French chef, Honoré Julien. In addition, from 1813 on, recipes for what can be described as “French fries” occur in popular American cookbooks. By the late 1850s, a cookbook was published that used the term French fried potatoes. The thick-cut fries are called Pommes Pont-Neuf or simply pommes frites (about 10 mm); thinner variants are pommes allumettes(matchstick potatoes; about 7 mm), and pommes paille (potato straws; 3–4 mm). (Roughly 0.4, 0.3 and 0.15 inch respectively.) Pommes gaufrettes are waffle fries. A popular dish in France is steak-frites, which is steak accompanied by thin French fries. The town of Florenceville-Bristol, New Brunswick, headquarters of McCain Foods, calls itself “the French fry capital of the world” and also hosts a museum about potatoes called “Potato World”. 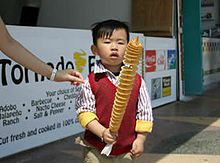 It is also one of the world’s largest manufacturers of frozen French fries and other potato specialties. A popular Québécois dish is poutine, such as this one from La Banquiserestaurant in Montreal. It is made with French fries, cheese curds and gravy. Frites are the main ingredient in the Canadian/Québécois dish known (in both Canadian English and French) as poutine; a dish consisting of fried potatoes covered with cheese curds and brown gravy. Poutine has a growing number of variations but is generally considered to have been developed in rural Québec sometime in the 1950s, although precisely where in the province it first appeared is a matter of contention. Canada is also responsible for providing 22% of China’s French fries. French fries migrated to the German-speaking countries during the 19th century. In Germany, where they are usually known by the French words pommes frites, or only Pommes or Fritten (derived from the French words but pronounced as German words). They are often served with mayonnaise, and are a popular walking snack offered by Schnellimbiss (“quick bite”) kiosks. Since the advent of Currywurst in the 1950s, a paper tray of sausage (bratwurst or bockwurst) anointed with curry ketchup, laced with additional curry powder and a side of french fries, has become an immensely popular fast food meal. The standard deep-fried cut potatoes in the United Kingdom are called chips, and are cut into pieces between 10 and 15 mm (0.39 and 0.59 in) wide. They are occasionally made from unpeeled potatoes (skins showing). British chips are not the same thing as potato chips (an American term); those are called “crisps” in Britain. 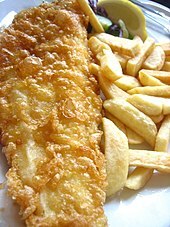 In the UK, chips are part of the popular, and now international, fast food dish fish and chips. The first chips fried in the UK were sold by Mrs. ‘Granny’ Duce in one of the West Riding towns in 1854. A blue plaque in Oldham marks the origin of the fish-and-chip shop, and thus the start of the fast food industry in Britain. In Scotland, chips were first sold in Dundee: “in the 1870s, that glory of British gastronomy – the chip – was first sold by Belgian immigrant Edward De Gernier in the city’s Greenmarket”.In Ireland the first chip shop was “opened by Giuseppe Cervi”, an Italian immigrant, “who arrived there in the 1880s”. It is estimated that in the UK, 80% of households buy frozen fries each year. Curly fries – characterized by their spring-like shape, cut from whole potatoes using a specialized spiral slicer. Fries tend to be served with a variety of accompaniments, such as salt and vinegar (malt, balsamic or white), pepper, Cajun seasoning, grated cheese, melted cheese, mushy peas, heated curry sauce, curry ketchup (mildly spiced mix of the former), hot sauce, relish, mustard, mayonnaise, bearnaise sauce, tartar sauce, chili, tzatziki, feta cheese, garlic sauce, fry sauce, butter, sour cream, ranch dressing, barbecue sauce, gravy, honey, aioli, brown sauce, ketchup, lemon juice, piccalilli, pickled cucumber, pickled gherkins, pickled onions or pickled eggs. French fries primarily contain carbohydrates (mostly in the form of starch) and protein from the potato, and fat absorbed during the deep-frying process. Salt, which contains sodium is almost always applied as a surface seasoning. For example, a large serving of French fries at McDonald’s in the United States is 154 grams. The 510 calories come from 66 g of carbohydrates, 24 g of fat, 7 g of protein and 350 mg of sodium. French fries contain some of the highest levels of acrylamides of any foodstuff, and concerns have been raised about the impact of acrylamides on human health. According to the American Cancer Society, it is not clear as of 2013 whether acrylamide consumption affects people’s risk of getting cancer. A meta-analysis indicated that dietary acrylamide is not related to the risk of most common cancers, but could not exclude a modest association for kidney, endometrial or ovarian cancers. A lower-fat method for producing a French fry-like product is to coat “Frenched” or wedge potatoes in oil and spices/flavoring before baking them. The heat will not be as high as when deep frying, and this also reduces acrylamides. In June 2004, the United States Department of Agriculture (USDA), with the advisement of a federal district judge from Beaumont, Texas, classified batter-coated French fries as a vegetable under the Perishable Agricultural Commodities Act. This was primarily for trade reasons; French fries do not meet the standard to be listed as a processed food. This classification, referred to as the “French fry rule”, was upheld in the United States Court of Appeals for the Fifth Circuit case Fleming Companies, Inc. v. USDA. In the United States, in 2002, the McDonald’s Corporation agreed to donate to Hindus and other groups to settle lawsuits filed against the chain for mislabeling French fries and hash browns as vegetarian because beef extract was added in their production. Jump up ^ “chip: definition of chip in Oxford dictionary (British English)”. Oxforddictionaries.com. 12 September 2013. Retrieved 16 September2013. Jump up ^ Indian English, “finger chip”. Cambridge Dictionary Online. Jump up ^ “Chunky oven chips”. BBC Good Food. BBC. Retrieved 7 March 2016. ^ Jump up to: a b c d e f Saint-Ange, Evelyn and Aratow, Paul (translator) (2005) . La Bonne Cuisine de Madame E. Saint-Ange: The Essential Companion for Authentic French Cooking. Larousse, translation Ten Speed Press. p. 553. ISBN 1-58008-605-5. Jump up ^ Fannie Farmer, The Boston Cooking-School Cook Book, 1896, s.v. Jump up ^ Blumenthal, Heston (17 April 2012). “How to cook perfect spuds”. the age. Retrieved 12 October 2012. Jump up ^ Bocuse, Paul (10 December 1998). La Cuisine du marché (in French). Paris: Flammarion. ISBN 978-2-08-202518-8. ^ Jump up to: a b c “Russet Burbank”. idahopotato.com. Retrieved January 9, 2018. Jump up ^ “The Making of French Fries”. thespruce.com. Retrieved December 8,2017. ^ Jump up to: a b Grace, Francie (5 June 2002). “McDonald’s Settles Beef Over Fries”. CBS News. Retrieved 4 May 2011. ^ Jump up to: a b Ebeling, Charles (31 October 2005). “French fried: From Monticello to the Moon, A Social, Political and Cultural Appreciation of the French Fry”. The Chicago Literary Club. Retrieved 12 January 2007. Jump up ^ Fishwick, Marshall W (1998). “The Savant as Gourmet”. The Journal of Popular Culture. Oxford: Blackwell Publishing. 32 (part 1): 51–58. doi:10.1111/j.0022-3840.1998.3201_51.x. Jump up ^ Home : Oxford English Dictionary. Oed.com. Retrieved 12 September 2012. ^ Jump up to: a b Schehr, Lawrence R.; Weiss, Allen S. (2001). French Food: On the Table On the Page and in French Culture. Abingdon: Routledge. p. 158. ISBN 0415936284. ^ Jump up to: a b (in French) Hugues Henry (16 August 2001) “La Frite est-elle belge?”. Archived from the original on 24 May 2013. Retrieved 3 March 2012. . Frites.be. Retrieved 12 September 2012. ^ Jump up to: a b Ilegems, Paul (1993). De Frietkotcultuur (in Dutch). Loempia. ISBN 90-6771-325-2. Jump up ^ McDonald, George (2007). Frommer’s Belgium, Holland & Luxembourg. Wiley Publishing. p. 485. ISBN 978-0-470-06859-5. Jump up ^ Handy, Mrs. Moses P. “Kitchen Economy in France”, Good Housekeeping, Volumes 28–29 159 Vol XXIX No 1 July 1899 Whole No 249. Retrieved 16 November 2014. Jump up ^ Schehr, Lawrence R.; Weiss, Allen S. (2001). French Food: On the Table On the Page and in French Culture. Abingdon: Routledge. pp. 158–9. ISBN 0415936284. Jump up ^ (in Dutch) Patatzak vouwen – Video – Allerhande – Albert Heijn. Ah.nl. Retrieved on 13 November 2016. Jump up ^ “La Frite se mange-t-elle à toutes les sauces?” (in French). Frites.be. 2011. Archived from the original on 16 November 2008. Retrieved 20 April 2011. Jump up ^ “Patatas Bravas”. spanish-food.org. Retrieved November 12, 2017. Jump up ^ “Galicia Origins”. all-about-potatoes.com. Retrieved November 12,2017. Jump up ^ “Saint Teresa”. aleteia.org. Retrieved November 12, 2017. Jump up ^ “La frite est-elle Belge ou Française ?”. Le Monde (in French). 2 January 2013. Retrieved 3 February 2014. Jump up ^ Le Moyne Des Essarts, Nicolas-Toussaint (1775). Causes célebres curieuses et interessantes, de toutes les cours …, Volume 5, p. 41 and P. 159. Retrieved 16 November 2014. Jump up ^ N.B. museum celebrates the humble spud | The Chronicle Herald. Thechronicleherald.ca (19 September 2014). Retrieved on 2016-11-13. Jump up ^ About McCain Foods – Global Family Owned Food Business. Mccain.com (31 December 1989). Retrieved on 2016-11-13. Jump up ^ Semenak, Susan (6 February 2015). “Backstage at La Banquise – because it’s always poutine week there”. Montreal Gazette. Jump up ^ Kane, Marion (8 November 2008). “The war of the curds”. The Star. Retrieved 16 December 2001. Jump up ^ “Canada’s Imports”. frozenfoodsbiz.com. Retrieved January 7, 2018. 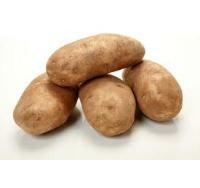 ^ Jump up to: a b “Potato Imports to China Report”. Retrieved January 7, 2018. Jump up ^ Chaloner, W. H.; Henderson, W. O. (1990). Industry and Innovation: Selected Essays. Taylor & Francis ISBN 0714633356. Jump up ^ “Dundee Fact File”. Dundee City Council. Archived from the originalon 8 April 2007. Retrieved 20 March 2007. Jump up ^ “A postcard, Giuseppe Cervi and the story of the Dublin chipper”. Come Here To Me!. 2017-03-14. Retrieved 2017-03-15. Jump up ^ “Popularization”. today.com. Retrieved January 3, 2018. Jump up ^ “Frozen Potato Fries Situation and Outlook”. Archived from the original on 15 December 2013. Retrieved 12 September 2012. Jump up ^ “China’s US importation”. forbes.com. Retrieved January 7, 2018. Jump up ^ “Pre-Made Fries”. historyoffastfood.com. Retrieved January 3, 2018. Jump up ^ “Flavor Coatings”. EcolefoodPolitics.wordpress.com. Retrieved January 3, 2018. Jump up ^ “Amount of French Fries”. foxnews.com. Retrieved January 4, 2018. Jump up ^ “French Fries Amount”. fooddemocracy.wordpress.com. Retrieved January 4, 2018. ^ Jump up to: a b c d e f g Lingle, B. (2016). Fries! : An Illustrated Guide to the World’s Favorite Food. 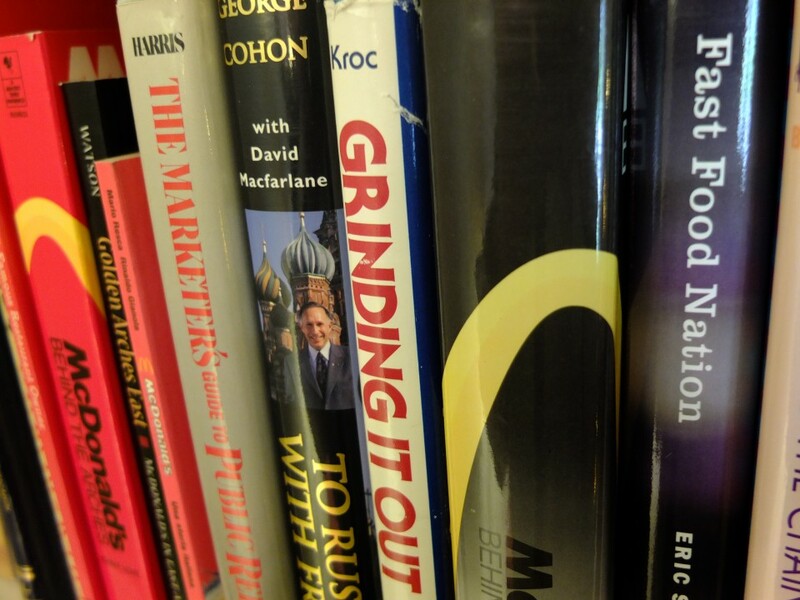 Chronicle Books. pp. 50–53. ISBN 978-1-61689-504-4. Retrieved July 1, 2017. Jump up ^ The U.S. Open is selling a delicious sandwich with french fries on it | For The Win. Ftw.usatoday.com (17 June 2016). Retrieved on 2016-11-13. Jump up ^ List of accompaniments to french fries – Unlikely Words – A blog of Boston, Providence, and the world. Unlikely Words (7 November 2011). Retrieved 12 September 2012. Jump up ^ “McDonald’s Nutrition Facts for Popular Menu Items” (PDF). nutrition.mcdonalds.com. ^ Jump up to: a b c Fried Potatoes and Acrylamide: Are French Fries Bad For You?. Time.com (11 June 2015). Retrieved on 2016-11-13. Jump up ^ “Health Risks”. forbes.com. Retrieved January 4, 2018. Jump up ^ “McDonalds Trans fats”. reuters.com. Retrieved January 4, 2018. Jump up ^ “Burger King Trans fats”. Nbcnews.com. Retrieved January 4, 2018. ^ Jump up to: a b “Acrylamide”. American Cancer Society. 1 October 2013. ^ Jump up to: a b Pelucchi C, Bosetti C, Galeone C, La Vecchia C (2015). “Dietary acrylamide and cancer risk: an updated meta-analysis”. Int. J. Cancer. 136 (12): 2912–22. doi:10.1002/ijc.29339. PMID 25403648. Jump up ^ “Eat Fries—Guilt-Free!”. Prevention. Retrieved 19 April 2016. Jump up ^ “Country of Origin Labelling: Frequently Asked Questions”. Agricultural Marketing Service. 12 January 2009. Jump up ^ Dreyfuss, Ira (16 June 2004). “Batter-Coated Frozen French Fries Called Fresh Vegetable”. The Washington Post. Jump up ^ “AGRICULTURAL MARKETING AGREEMENT ACT – vol63_at_958.pdf” (PDF). Archived from the original (PDF) on 15 December 2013. Retrieved 16 September 2013. Jump up ^ “04-40802: Fleming Companies v. Dept of Agriculture :: Fifth Circuit :: US Court of Appeals Cases :: Justia”. Law.justia.com. Retrieved 16 September 2013. Wikimedia Commons has media related to French fries. Look up french fries in Wiktionary, the free dictionary. Lingle, Blake (2016). Fries! : An Illustrated Guide to the World’s Favorite Food. New York: Princeton Architectural Press. ISBN 9781616894580. Tebben, Maryann (2006). “French Fries: France’s Culinary Identity from Brillat-Savarin to Barthes (essay)”. Convivium Artium. University of Texas at San Antonio. Retrieved 28 December 2009. Chances are, you probably already know how to make French fries. Toss sliced potatoes with a little bit of oil, transfer to a baking sheet, and bake until crispy. It’s so easy that your dog could probably do it, if only your dog had opposable thumbs. So why do they never seem to turn out as golden and delicious as you expected? Because, like with all seemingly simple recipes, there’s a way to getting things just right. Don’t worry—it’s not complicated. In fact, you don’t even need a recipe. To make really delicious oven fries, all you need is the right ingredients in the right ratios, plus a few basic techniques to achieve that mouthwatering crisp-on-the-outside, fluffy-on-the-inside texture. Here’s how to do it. 1. Start with the right spuds. Opt for plain old Russet potatoes. Unlike Yukon Golds or red-skinned potatoes, they’re starchy instead of waxy. And that high-starch content is key for helping your fry crisp up on the outside while staying fluffy on the inside, says Paul Malvone, executive chef of the burger meal-delivery kit service BurgaBox. 2. Slice them on the thinner side. Just like a great French fry, a great oven fry needs the right balance of crisp outer crust to soft, fluffy center. To get that, you want potato slices that are about 1/4-inch thick, says Malvone. Fries sliced thinner will burn before they finish cooking through. Go thicker, and you’ll be veering into baked potato territory. 3. Pat them dry and toss with a secret ingredient. Moisture on the outside of your potato slices makes it harder for oil to adhere to the surface. And if the oil can’t adhere to the surface, your fries won’t crisp up. Give your sliced potatoes a quick pat with a paper or kitchen towel to dry them off. Then toss them with a little bit of cornstarch, Malvone says. It might sound surprising, but the cornstarch absorbs even more moisture and helps form a crust-like outer layer that’ll deliver maximum crispiness. You don’t need much—just a tablespoon per pound of potatoes. 4. Don’t skimp on the fat. There’s no need to douse your potatoes in oil. But coating them in a thin layer of fat is a must for crisp, crunchy fries. “If you don’t use any oil, the texture will be softer, like a baked potato,” Malvone says. Use 1 to 2 tablespoons of olive or canola oil per pound of potatoes, and toss the potato slices with the oil thoroughly to make sure that every piece is fully coated. 5. Spread them out evenly on the baking sheet. Arrange potato slices in a single layer so no pieces are overlapping. (If the pieces overlap, use a second baking sheet or bake the potatoes in batches.) Spuds that don’t have enough breathing room will steam instead of crisp up, Malvone explains. 6. Crank up the oven. Heat—and plenty of it—gets fries crispy on the outside and creamy on the inside. The magic temperature is 450 Fahrenheit, Malvone says. Just make sure your oven has fully finished preheating before placing the fries inside. The super-high temperature will cause the outside of the fries to start sizzling immediately, sending them on their way to golden brown deliciousness. 7. Flip them halfway through. Fries are pretty low-maintenance once they’re in the oven. Just bake them for 20 to 25 minutes until they’re crisp and golden on the outside and soft on the inside. And make sure to flip them halfway through. That’ll promote even browning, so your finished fries are crunchy on all sides instead of just on the bottom, says Malvone. You probably won’t have much trouble here, but make sure to serve your fries hot from the oven (preferably with a sprinkle of sea salt for extra flavor). Just like French fries, oven fries start to lose their crispness as soon as they cool. So hurry up and dig in! The days of getting your fingers dirty while sopping up toppings with fries are over. 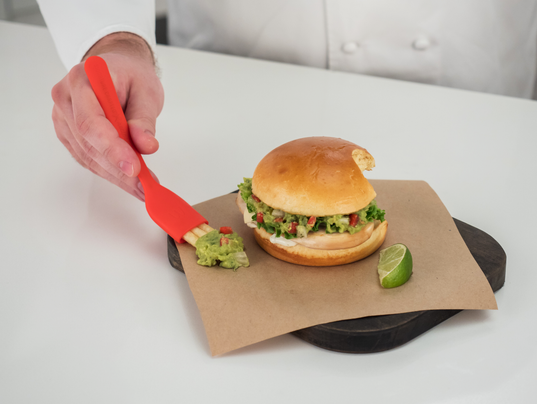 McDonald’s unveiled a “uselessly useful” utensil called a “frork” Monday in a hilarious infomercial hosted by McDonald’s Chef Mike and pitchman Anthony Sullivan. The frork is essentially a fork, but with French fries. The frork was released as part of the rollout of McDonald’s new Signature Crafted Recipe Sandwiches. 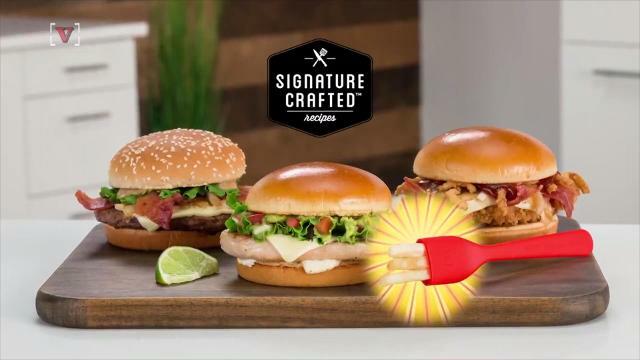 As Sullivan notes in the infomercial, the frork was developed to ensure customers can scoop up any toppings that fall out of McDonald’s new pico guacamole, sweet BBQ bacon and maple bacon dijon sandwiches. Sullivan notes that the “flavor-focused” frork allows people to ‘Pico’p the Pico guacamole” that inevitably falls out of the sandwich, and save every last bit of the maple bacon. “The frork is ludicrous-ly easy to use,” Sullivan says, noting that it can be used by those who are right handed and left handed, and even works in the dark. The frork will be available while supplies last at participating restaurants on May 5 with the purchase of a Signature Crafted Recipe sandwich. Because McDonald’s says an infomercial wouldn’t be a true infomercial without a toll-free number, the fast-food chain also included a phone number where the first 100 callers will receive a frork and the first 5,000 will recipe a coupon for a Signature Crafted Recipe sandwich: 1-844-McD-FRORK. Cue the first-world problem memes. The secret of delectable fries lies in the frying process. The oil needs to be just the right temperature — too cool, the potatoes will absorb the oil; too hot, the outsides of the potatoes will burn. Peel potatoes, and cut into desired size and shape. To make thick French fries, slice potatoes lengthwise into 1/4-inch slices, and cut again into 1/4-inch strips. For shoestring potatoes, use a mandoline fitted with the fine julienne blade. Make basket-weave-style fries by fitting the mandoline with the fluted cutting blade; rotate the potato 90 degrees between each pass over the blade. Place sliced potatoes in a large nonreactive bowl, and cover with water. Drain potatoes, and dry thoroughly with a towel. Heat 3 to 4 inches oil in a heavy-bottomed pot over medium heat. Use a thermometer to ensure the temperature is correct: 325 degrees for French fries, 375 degrees for shoestring and basket-weave fries. Carefully add potatoes to oil in small batches so as not to lower the temperature of the oil. Cook shoestring and basket-weave potatoes for 2 to 3 minutes, turning occasionally. French fries need to cook for 5 to 6 minutes, turning occasionally. They will not take on much color at this point. Transfer to a flattened brown paper bag that has been lined with paper towels, and let cool for a few minutes or until just before ready to serve. French fries need to be fried a second time: Raise oil temperature to 375 degrees. and fry for until crisp and golden, about 1 to 2 minutes. Remove from oil, and drain again on the paper bag. Sprinkle with salt, and serve.